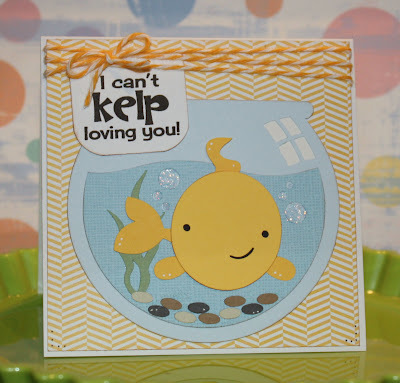 This DARLING little fish a Miss Kate Cuttables file from is from the Silhouette Store - I love him! 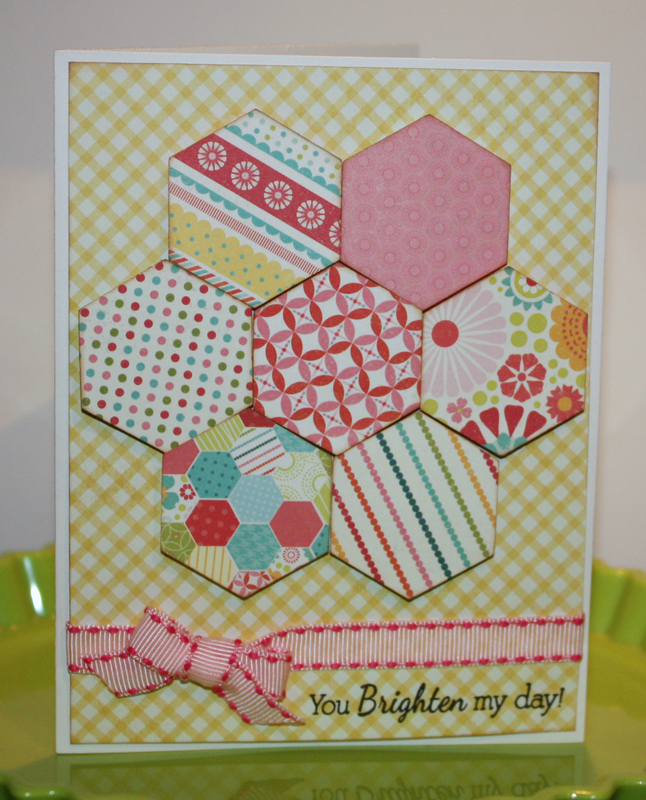 :) Because he is so stinkin' cute I made my card base simple - patterned paper and twine. I rounded the bottom of a square for my title to mimic the shape of the fishbowl and used a sentiment from our new Beach Bums stamp set. Thank you for stopping by - I hope you enjoyed my card as much as it do! :) Have a fabulous weekend! Scrappy Moms Sneak Peek #2 - Life is Good! 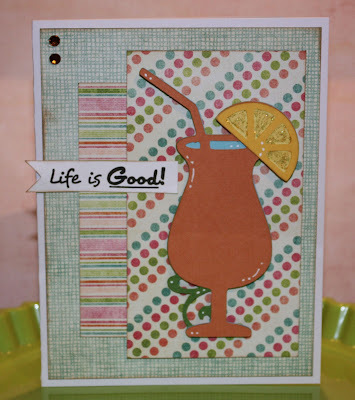 I used a Lettering Delights SVG file from their Seasoned Summer set and MTC to create layers for my summer drink. I added Stickles to the lemon slice, a couple of gems and a sentiment from our brad-new Beach Bums stamp set to completed the card. 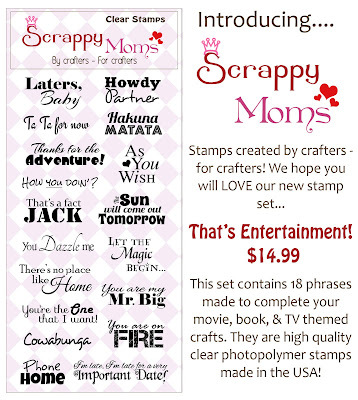 Be sure to visit the whole Scrappy Moms DT - including our very sweet and talented April Guest Designer, Brianna from Happy Scrapper - all this week for projects with our 2 new stamp sets. 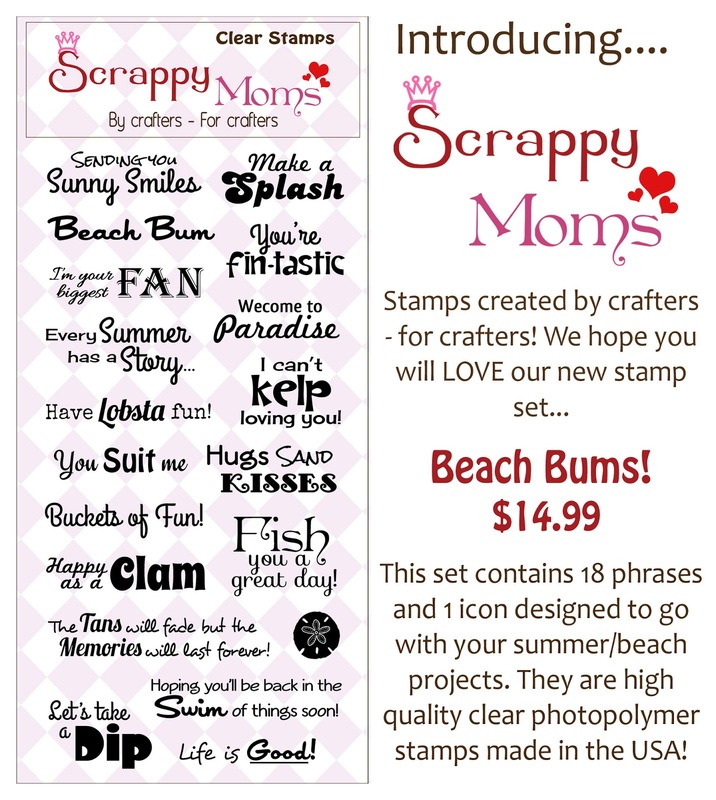 Two new Scrappy Moms Stamps - Beach Bums and That's Entertainment! 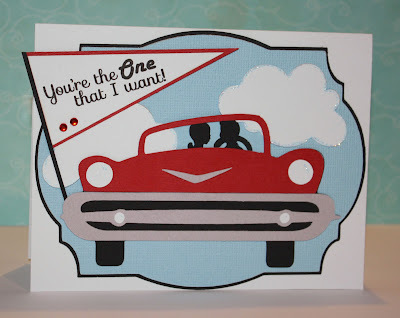 I used Lacy Labels to create the shape background, Nifty Fifties to create my car and Sweethearts for "Danny and Sandy". I just love the movie Grease and tried to re-create the final scene when they fly off into the clouds. I used a little Stickles on the clouds and 2 red gems for a little bling. I decided to use a pennant shape for my sentiment as it reminded me of school games. "You're the One that I want!" is from our new That's Entertainment set. 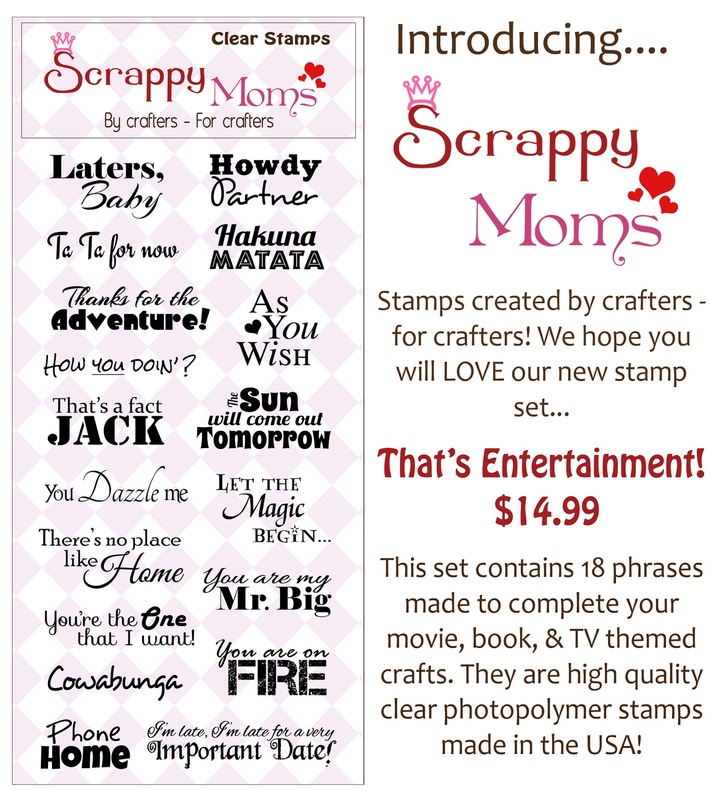 Be sure to visit our wonderful design team - including our April Guest Designer, the very creative Brianna from Happy Scrapper - all this week for new creations using both of these new sets. I hope you will come back to see what else I create this week! The challenge this week is to make a project that includes a flower. I decided to make my flower on the "Stylized" side! I got a couple of brand new toy this week - a Fiskars Medium Octagon punch and several new 6 x 6 paper pads by Echo Park. 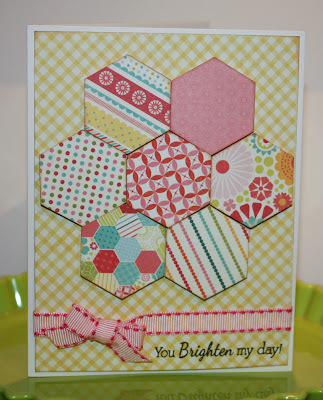 The pad I used for this card is called So Happy Together. I added a ribbon/bow in a pink stiched ribbon from Michaels and a sentiment from SMS Quirky Quotes. I hope you enjoyed my card and that you will link up your flower project for a chance to win a Scrappy Moms stamps set of your choice! We hope you will come play along with us and link up your pinwheel project for a chance to win a Scrappy Moms Stamps set of your choice. Thank you for visiting my blog! I hope that you enjoy what you see. 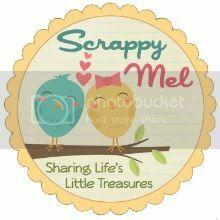 I am the SAHM of 3 cute kids and I LOVE to scrapbook, make cards and read. 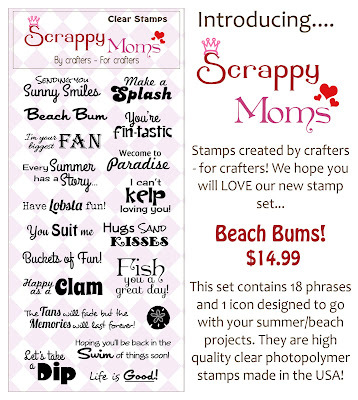 In June 2010, my friend Tammy and I started Scrappy Moms Stamps. We have had such fun creating stamps for our fellow crafters (and ourselves) and have met SO MANY WONDERFUL people along the way! Please feel free to leave a comment - I'd love to hear from you!